Fungal endocarditis (FE) is uncommon and is associated with a high mortality (56-70%), particularly in developing countries. Two most comprehensive reviews encompassing cases from all age groups reported in English literature from 1965 to 2000 yielded a total of 422 cases. , Incidence of infective endocarditis in children is 0.8-3.3 per 1000 inpatients. , The case frequency of FE is about 1.5-4 per 10 million children and it constitutes up to 12% of all pediatric cases of infective endocarditis. , Among children, 63% of cases are described in neonates and infants younger than 1 year. 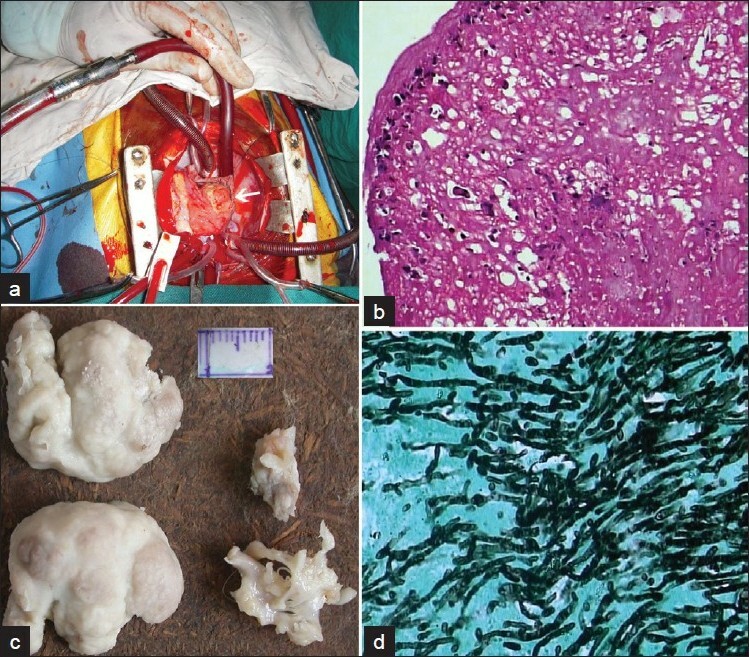 We report a case of Candida tropicalis endocarditis in a child, without any underlying cardiac abnormality or previous cardiac surgery, which fulfilled Duke's criteria  and was confirmed by histopathology and mycology. A 5-year-old female was admitted with a 7-day history of high-grade fever with chills and dry cough and breathlessness since 4 days. She had been treated (for 40 days) 4 months ago for bilateral empyema (with intercostal drainage and multiple broad spectrum antibiotics- ceftriaxone, cloxacillin and amikacin) and drainage of two cutaneous abscesses, one each in right paravertebral area and on the left forearm. The empyema fluid did not grow any organism. Peripheral blood smear for sickling test was negative. She had required admission to the pediatric intensive care unit (PICU) for mechanical ventilation and central venous pressure monitoring. Enzyme-linked immunosorbent assay (ELISA) for HIV antibodies was negative. At discharge after 46 days of hospital stay, she was asymptomatic but had persistent bilateral pleural thickening with minimal left-sided pleural effusion on the computed tomography (CT) scan. During the present admission, she had fever with a respiratory rate of 38/minute, intercostal and subcostal retractions, pallor and periorbital edema. Cardiovascular examination revealed a grade 2/6 pansystolic murmur in the tricuspid area, apical pericardial rub and a tender hepatomegaly (liver span of 11 cm). She was malnourished (weight of 14 kg, <5 th percentile for age) with a height of 106 cm (25th percentile for age). Investigations revealed hemoglobin 6.5 g/dl, leukocyte count 29,800/mm 3 (with 81% neutrophils) and platelet count of 71,000/mm 3 . The C - reactive protein (CRP) was 116 mg/l with normal erythrocyte sedimentation rate (ESR) and urinalysis. Blood bacterial culture was sterile. 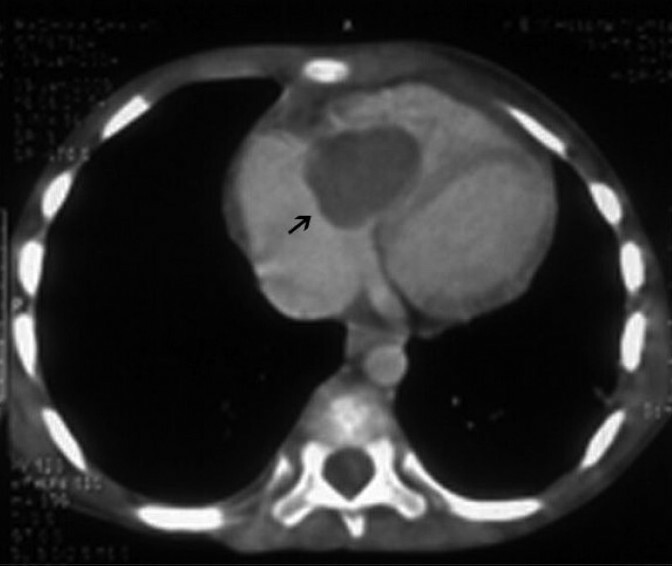 Chest radiograph showed cardiomegaly (cardiothoracic ratio 0.59) without pleural effusion or pleural thickening. The provisional diagnosis was pericardial effusion. Two-dimensional echocardiography showed a 25 Χ 20 mm heterogeneous mass attached to the base of the right ventricular lateral wall. It prolapsed into the right atrium, producing right ventricular inflow obstruction and grade I tricuspid regurgitation. CT scan of the thorax confirmed the vegetation [Figure 1]. Intravenous ampicillin, cloxacillin and gentamicin were initiated for endocarditis. Furosemide was given for cardiac failure. FE was strongly considered in view of the prior PICU stay, prolonged broad-spectrum antibiotic therapy, indwelling central venous catheter, prolonged chest drainage and presence of large right-sided heterogeneous vegetations. Blood samples were sent for fungal culture and intravenous fluconazole (12 mg/kg loading dose followed by 10 mg/kg/day) was initiated. C. tropicalis (species identification done on chrome agar) was cultured on day 7 of admission and fluconazole was substituted by liposomal amphotericin B (3 mg/kg/day, gradually increased to 5 mg/kg/day). Antibiotics were discontinued. As fever and cardiac failure persisted, a repeat echocardiography was done on day 33 of amphotericin B therapy, which revealed an increase in the size of the vegetation to 28 Χ 28 mm. Therefore, surgical removal of the entire vegetation with total tricuspid valve (TV) excision was performed. Histopathologic examination [Figure 2] and culture of the resected vegetation on Sabouraud's agar confirmed C. tropicalis. Postoperatively, furosemide and digoxin were continued for tricuspid regurgitation to prevent overt cardiac failure. Liposomal amphotericin B was continued for 2 weeks postoperatively (total 7 weeks of therapy). She became afebrile and signs of cardiac failure resolved after 7 days of operation (49 days of admission). The child was discharged after a ward stay of 56 days. Tricuspid valve replacement was envisaged at a later age, as pediatric TV replacement is associated with a poorer prognosis and higher rates of failure than in adults. Moreover, the patient was asymptomatic on digoxin and furosemide despite having free tricuspid regurgitation. In the present case, the patient was an obviously malnourished child, from a lower socioeconomic class, with illiterate parents. Though poor nutrition may have provided a predisposition to repeated infection and its sequelae (like hospital admission) and endocarditis, it would have been important to rule out an immunodeficiency syndrome. The parents were unable to afford investigations and treatment, and her medical and surgical treatment was entirely funded by our institute. This is a common situation in India where physicians are compelled to use the scant resources for treatment rather than a complete diagnostic work-up. In a prospective, observational study at 18 medical centers in Italy, including all consecutive patients with a definite diagnosis of IE admitted from January 2004 through December 2007, Candida species was the causative organism in eight cases of prosthetic valve endocarditis, five cases of native valve endocarditis, one case of pacemaker endocarditis, and one case of left ventricular patch infection. The Candida species accounted for 1.8% of total cases and for 3.4% of prosthetic valve endocarditis cases; the overall mortality rate was 46.6%. Luciani et al. have also described a case of a premature infant with mutliple Candida tricuspid valve mycetomas wherein eradication of infection was achieved by combined liposomal amphotericin therapy and complex tricuspid valve repair. Similarly, Zenker et al. have described three critically ill infants, two weighing less than 1000 g, who survived Candida endocarditis without surgery (treatment done with amphotericin B and 5-flucytosine only). The currently described patient was a rare case of tricuspid valve FE due to C. tropicalis since he was without any predisposing cardiac abnormality or previous cardiac surgery or immunocompromised state due to drugs, HIV, malignancy or diabetes mellitus, who was successfully treated with a combined medical and surgical approach and the diagnosis confirmed by histopathologic and mycologic methods. The clinicians should think beyond normal barriers in such unusual cases. The authors thank Dr. Sanjay Oak, Director (Medical Education and Major Hospitals, Municipal Corporation of Greater Mumbai) and Dean of Seth G.S. Medical College and K.E.M. Hospital, for granting permission to publish this manuscript. The authors also thank Dr. A. M. Patwardhan, Professor and Head, Department of Cardiovascular and Thoracic Surgery, Seth G.S. Medical College and K.E.M. Hospital, for operating the patient and for his kind support in the publication. 1. Pierrotti LC, Baddour LM. Fungal endocarditis, 1995-2000. Chest2002;122:302-10. 2. Ellis ME, Al-Abdely H, Sandridge A, Greer W, Ventura W. Fungal endocarditis: evidence in the world literature, 1965-1995. Clin Infect Dis 2001;32:50-62. 3. Millar BC, Jugo J, Moore JE. Fungal endocarditis in neonates and children. Pediatr Cardiol 2005;26:517-36. 4. Durack DT, Lukes AS, Bright DK. The Duke Endocarditis Service: new criteria for diagnosis of infective endocarditis: Utilization of specific echocardiographic findings. Am J Med 1994;96:211-9. 5. Bartlett HL, Atkins DL, Burns TL, Engelkes KJ, Powell SJ, Hills CB, et al. Early outcomes of tricuspid valve replacement in young children. Circulation 2007;115:319-25. 6. Saito Y, Takahashi M, Sato A, Katsuki T, Ikeda U, Shimada K. Isolated tricuspid valve endocarditis due to candida parapsilosis associated with long term central venous catheter implantation. Intern Med 2001;40:403-4. 7. Hollingsed MJ. Surgical management of catheter tip thrombus: Surgical therapy for right atrial thrombus and fungal endocarditis (Candida tropicalis) complicating pediatric sickle-cell disease. Perfusion 1997;12:197-201. 8. Melamed R, Leibovitz E, Abramson OA, Levitas A, Zucker N, Gorodisher R. Successful non-surgical treatment of Candida tropicalis endocarditis with liposomal amphotericin-B (AmBisome). Scand J Infect Dis 2000;32:86-9. 9. Aspesberro F, Beghetti M, Oberhansli I, Friedli B. Fungal endocarditis in critically ill children. Eur J Pediatr 1999;158:275-80. 10. Karatza AA, Dimitriou G, Marangos M, Christofidou M, Pavlou V, Giannakopoulos I, et al. Successful resolution of cardiac mycetomas by combined liposomal amphotericin B with fluconazole treatment in premature neonates. Eur J Pediatr 2008;167:1021-3. 11. Stripeli E, Tsolia M, Trapali Ch, Papaevangelou V, Vlachos E, Pasparakis D, et al. Successful medical treatment of Candida endocarditis with liposomal amphotericin B without surgical intervention. Eur J Pediatr 2008;167:469-70. 12. Pappas PG, Rex JH, Sobel JD, Filler SG, Dismukes WE, Walsh TJ, et al. Guidelines for treatment of Candidiasis. Clin Infect Dis 2004;38:161-89. 13. Blyth CC, Palasanthiran P, O'Brien TA. Antifungal therapy in children with invasive fungal infections: A Systematic Review. Pediatrics 2007;119:772-84. 14. Falcone M, Barzaghi N, Carosi G, Grossi P, Minoli L, Ravasio V, et al. Italian Study on Endocarditis. Candida infective endocarditis: report of 15 cases from a prospective multicenter study. Medicine (Baltimore) 2009;88:160-8. 15. Luciani GB, Casali G, Viscardi F, Marcora S, Prioli MA, Mazzucco A. Tricuspid valve repair in an infant with multiple obstructive Candida mycetomas. Ann Thorac Surg 2005;80:2378-81. 16. Zenker PN, Rosenberg EM, Van Dyke RB, Rabalais GP, Daum RS. Successful medical treatment of presumed Candida endocarditis in critically ill infants. J Pediatr 1991;119:472-7. La Hoz, R.M., Baddley, J.W.